Warrington put in a solid performance to beat Hull KR 28-14 and maintain their winning start to the Super League season. Steve Price made two changes to his Warrington squad that beat Leeds Rhinos last week. Harvey Livett and Lama Tasi replaced banned duo Toby King and Ben Westwood. Hull KR head coach Tim Sheens named an unchanged side from the one that beat rivals Hull FC last time out. The visitors took an early lead at the Halliwell Jones Stadium through Ben Crooks, before Livett went over for Warrington midway through the first half. Warrington’s marquee man Blake Austin was sent to the sin bin in the 26th minute after leading with the elbow in a tackle on Hull KR skipper Joel Tomkins. The Robins took full advantage of having the extra man as Craig Hall went over, but the Wolves led 12-8 at the interval thanks to a Tom Lineham acrobatic dive. Livett got his second of the game after half-time, before Josh Charnley’s full-length effort put the game out of reach for Hull KR. Jimmy Keinhorst scored a consolation try for the Robins in the 70th minute, before Mike Cooper went over to secure a good 28-14 win for the Wolves. Hull KR are an enjoyable team to watch for the neutral fan. They threw the ball around and everyone knew their roles in the team, whereas in previous seasons they have looked toothless when going forward. Danny McGuire and Josh Drinkwater have built up a good combination in the halves and they guide the team around the park very well, as well as bringing a good kicking game. What is a positive for Hull KR this year is that they have no areas of weakness. Their team is solid throughout the backline and their pack. Even though they didn’t get the result they wanted, fans can be encouraged by their performance at Warrington. 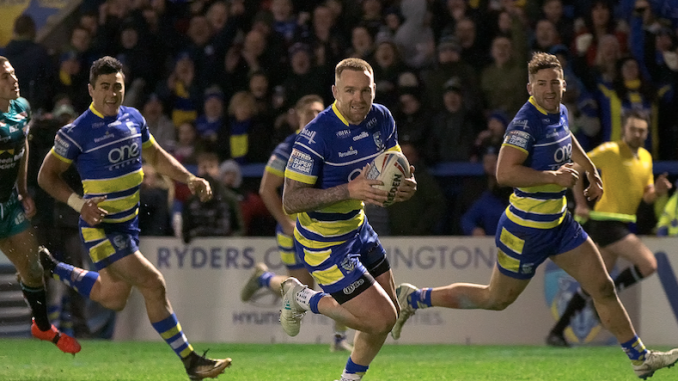 Blake Austin has only played two games in Super League for Warrington, but it is already clear as to why he is Betfred’s favourite to pick up the 2019 Steve Prescott Man of Steel award. The 28-year-old is a true maverick of the game. Apart from his yellow card in the first half, it was another superb display from him. His flat passes are dangerous, and his running game proves to be a constant threat for the opposition. Austin is one of those players that is a delight to watch, no matter who you support. The Portugal international has penned a three-year deal with the Wolves and we should embrace him in Super League for however long he is over here for. Steve Price has built a very, very strong Warrington team for the 2019 season. If you created a team beyond their 1-17 squad numbers, it would still be impressive and would give other Super League teams a run for their money. Westwood and King were unavailable for the game due to them serving suspensions, but you know you’ve got a top-class squad when you can bring in the likes of Livett and Tasi. The news that Kevin Brown would miss the season through injury was a big blow for Warrington. His replacement, Declan Patton, is a promising half-back though and the game time and experience he will get by playing alongside Austin this year will be invaluable. Let’s not forget about hot prospects Danny Walker and Luis Johnson either. Warrington: Ratchford (8); Lineham (7), Goodwin (7), Atkins (6), Charnley (6); Austin (9), Patton (8); Hill (8), Clark (7), Cooper (8), Livett (8), Hughes (7), Clark (7). Subs: Murdoch-Masila (6), Walker (6), Philbin (7), Tasi (6). Hull KR: Atkin (7); Crooks (7), Keinhorst (8), Linnett (6), Hall (6); McGuire (7), Drinkwater (6); Masoe (7), Lee (7), Mulhern (7), Tomkins (6), Hauraki (6), Lawler (5). Subs: Garbutt (7), Greenwood (6), Addy (6), Vaivai (6). Warrington will be a very, very tough side to beat at home this season. They have already dispatched strong Leeds and Hull KR teams and with the fans behind them, they could well make the Halliwell Jones Stadium a fortress this year. Austin is a player who you would happily pay the ticket money for and he is going to light up the competition just like Ben Barba did for St Helens last year. I’m tipping the Wolves to pick up silverware this season. As for Hull KR, their fans can be very pleased and courage by their performance. A couple of individual errors cost Sheens’ side so if they manage to clean them up then they could upset a few of the big boys this season.